I love it when things are simple and wonderfully useful. A recent quilting project (a post to come soon!) left me with achey back muscles. This quick and easy project came to the rescue. An added bonus for those living in snowy New England, throw them under your sheets right before bed. Toasty! (1) 10" square of cotton fabric for the inside, I used cotton muslin. This is the inside pouch to hold the rice, it needn't be fussy. (1) 10 1/2" x 14" rectangle of your beautiful fabric of choice for the pouch's little pillow case. Be sure to use 100% cotton fabrics, these will be going in the microwave. Next, fold your pouch fabric in half and press. Stitch along two sides leaving one short side open. If you're serging and don't want to stop the stitch, try rounding the corner of the fabric and turning it when you stitch as you would on a regular sewing machine. This gives you a nice corner and you don't have to pick up the foot. Next, fill the pouch with 2 cups of long, white rice and then stitch the open end closed. Now, move on to your pillow case fabric. Fold the fabric in half, right sides together, on the long side and press. Like you did with the pouch, stitch along 2 sides, leaving one short end open. Take the open end and turn in the raw edges about half an inch or so and press. 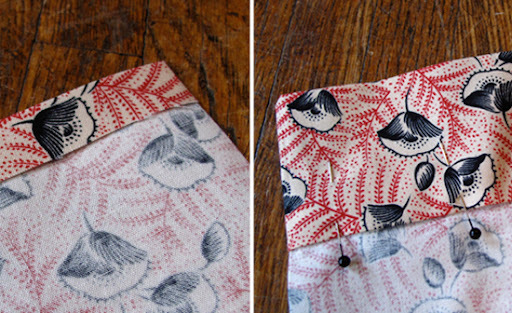 Then repeat but this time fold it in about 2 - 3 inches depending on the size of the hem you want; and again, press. 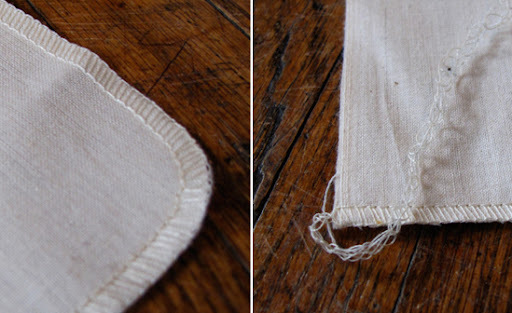 Pen your hem in place and stitch close to the edge of the first fold you made. If you're lucky, like me, this will be just big enough to slip on to your machine like a sleeve which makes sewing this round so much easier. Turn your pillow case right-side out and press. Drop in your rice sack and you're done! I have found that just 1 minute is all it takes in the microwave to get my packs just the right temperature. This project couldn't be simpler, they make great quick, last-minute gifts and a great excuse to use really fun prints you might not use for larger projects. I've sort of become obsessed with how cute these mini-pillow cases are and I'm certainly obsessed with warm toes in bed! I love these! When Allen and I were sick with the flu, I made one of these and it saved us. The rice retains heat perfectly! I made one for my mom, using an Amy Butler Lotus print, when she caught my bug. Now I don't feel so bad.